We revisited our very popular Double Vision afghan design to create this illusion afghan or wall-hanging. There are two illusions happening at the same time. 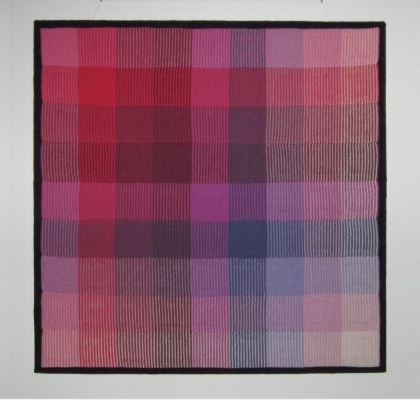 When you look straight at the knitting you see 81 different shades although it is made from only nine different yarns. When you look from an angle you see smaller squares inside the larger ones. 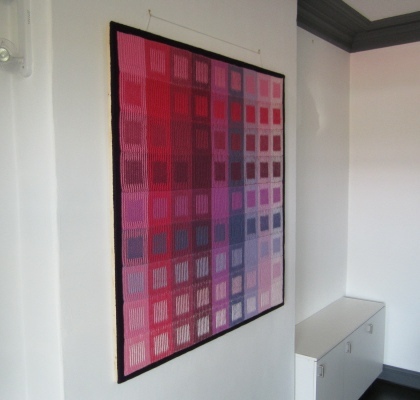 The wall-hanging in the photo was made using DK yarn. Any type of yarn can be used, in any colours. Changing the yarn may result in a larger, or smaller piece. Mathematically nine colours should give 45 different permutations so should show 45 shades. Because of the illusion technique this pattern actually shows 81 different shades. One-piece method - uses the intarsia technique. You will have ten yarns in use but only ever be working with one yarn across a particular block of stitches. There is no carrying of yarns. This gives a very smooth finish on back and front. Strip method - made in 9 strips which are stitched together. This is very easy knitting but the stitching needs to be done with care to ensure that the stripes stay lined up.